A tufted puffin on Prince William Sound, Alaska. U.S. Geological Survey experts found the seabird population density declined 2 percent annually from 1975 to 2012 in the northeast North Pacific. 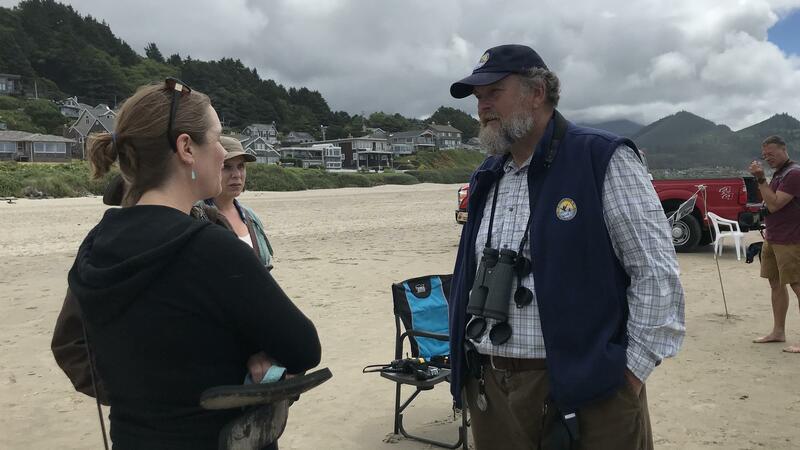 Art Broszeit, a volunteer for the Department of Interior, enjoys meeting beachgoers and talking about birds and ocean science. "Well, they're up there somewhere," Art Broszeit said, softly, as he patiently scanned the rock, looking for the elusive tufted puffin. 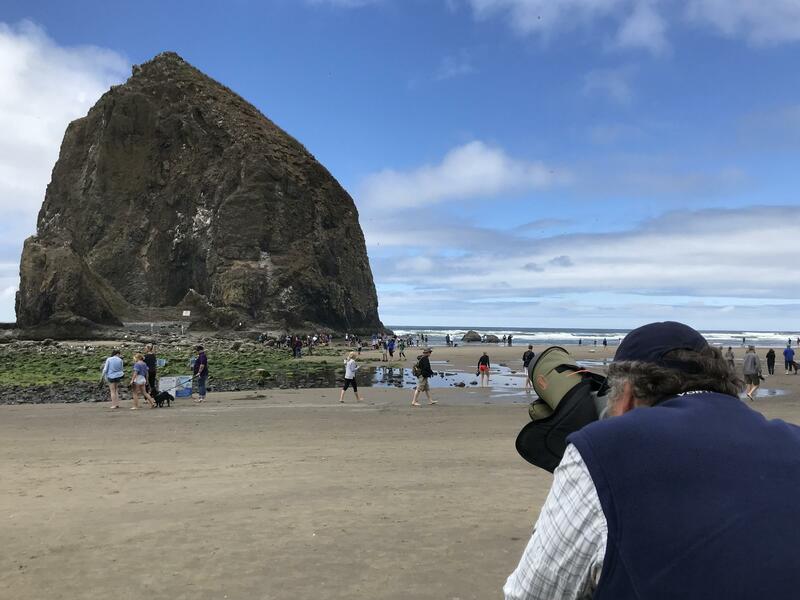 Cannon Beach locals have nicknamed Broszeit the "Puffin Man," a citizen scientist and de facto expert on the exotic cold climate birds that are becoming harder and harder to find. "Everyone wants to come here and see puffins," Broszeit said. "I've had people specifically go to Iceland to see puffins and don't see them." But they're relatively easy to see in Oregon most summers. In fact, this may be one of the most accessible places in the world to get a glimpse of one. They're amazing. They have black and white faces, black bellies and a bright orange bill that has hooks in it that enable them to catch and hold fish. Right now, during the mating season, both the males and females have grown their signature "tuft," which looks like a strand of coiffed blond hair. "For such a small bird, they're pretty tough," Broszeit says, as he spots one taking flight from the rock. "They live out 100 miles off the shoreline here and the young ones, they'll spend their first four years out there." "So the fish are going down deeper into colder water and a lot of the birds just can't reach them," Broszeit says. I remembered how cool it was to explore the vast tide pools beneath the rock too when I was a kid. I was reassured to find that this clearly hasn't changed when I caught up with Connor Reblkin and his family, on a summer road trip from their home in the Canadian province of British Columbia. "I'd like to live up there, wouldn't you?" Connor asked. Watching over it all, Art Broszeit beams. Whether he's looking for puffins or answering questions from curious beachgoers, he says it's great to volunteer and give back, especially when it comes to getting people interested in science. "If I can spark interest in one or two young people to enjoy the outdoors, and look through the binoculars, it's a good day for me," he says. So what's next for the Puffin Man? Maybe home for a little bit of a break and then it's on to pick a new wild place to enjoy with visitors. As for me, my short road trip diversion is over and it's back to my actual reporting beat. It's hard not to feel a little nostalgia driving away. I know I can come back — but I wonder how long that will be true for the tufted puffins? One of the biggest tourist attractions on the Oregon coast is Haystack Rock. I'm looking at pictures now - wow, a monolithic rock at the edge of the ocean covered in grass surrounded by tidal pools. But the main thing visitors want to see is the puffins who live there. A volunteer has styled himself as the Puffin Man to help tourists reach their goal. Our intrepid correspondent Kirk Siegler went to a Haystack Rock to meet him. KIRK SIEGLER, BYLINE: In a fleece vest, clutching binocs (ph), meet Art Broszeit. ART BROSZEIT: Yeah, I've just recently been called, by the locals, the Puffin Man (laughter). BROSZEIT: They're up there somewhere. SIEGLER: ...Trying to spot the elusive tufted puffin. BROSZEIT: I see them flying. There's one flying there. A lot of times what happens is they come right out of their burrow and they just take flight. SIEGLER: This is about as far south as you'll still find the puffins, which burrow in and nest on this rock in the summer. They're cute - their black bellies, a bright orange bill, black and white faces, and the yellow tuft which looks like a strand of coiffed blond hair. The males and females grow the tufts during the mating season. BROSZEIT: For such a small bird, they're pretty tough because they live out 100 miles off the shoreline here. And the young ones, you know, they'll spend the first four years out there. SIEGLER: Art volunteers out here all summer and has met people who have trekked long distances to see these birds. BROSZEIT: Everybody wants to come here and see puffins. I've had people that specifically go to Iceland to see puffins and don't see them. And, you know, and I'd have them down here, and I try my best to give them a view of a puffin. SIEGLER: There used to be hundreds of puffins nesting on this rock. This summer, the official count is 30. One reason - their food source is becoming harder to reach due to climate change. BROSZEIT: The puffin's a diving bird. They dive down typically 40 to 60 feet. And so the fish - you know, the upper water - the upper parts of the ocean are warming. So the fish go down deeper into colder water, and a lot of the birds just can't reach them. 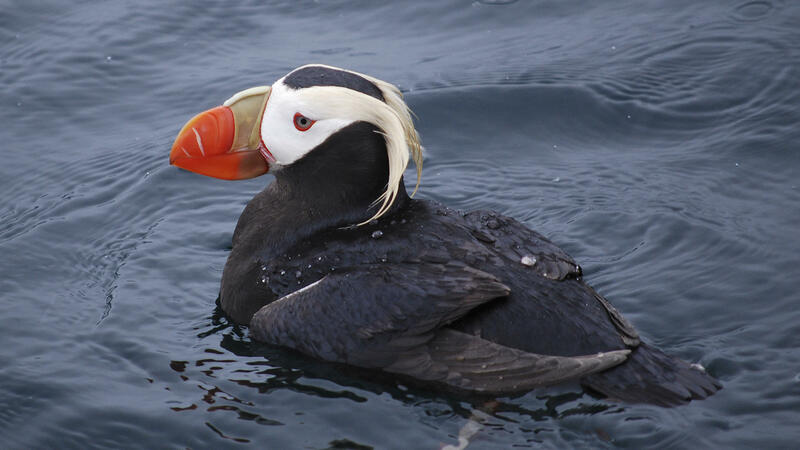 SIEGLER: So you'd better come see the tufted puffin while you still can. UNIDENTIFIED PERSON #1: Oh, I see a bird. UNIDENTIFIED CHILD: Dude, that bird's chilling. SIEGLER: There are plenty of other birds to see too - cormorants, black oystercatchers, cliff swallows. BROSZEIT: Oh, there's a bald eagle. There's a bald eagle right there. SIEGLER: Art says Haystack Rock is the eagles' dinner table, so most of the other birds take flight. SIEGLER: The eagles, the puffins, the waves and especially the tide pools beneath Haystack Rock are a hit with kids like Connor Reblkin. Connor is visiting from British Columbia, and it's his first time seeing Haystack Rock. CONNOR REBLKIN: I'd like to live up there. BROSZEIT: Up there - they're the black and white ones that kind of resemble a penguin. SIEGLER: Art Broszeit says, whether he's out looking for puffins or just answering questions from beachgoers, his is a great summer gig. BROSZEIT: If I can spark interest in one or two young people, you know, to enjoy, you know, the outdoors and looking through binoculars and stuff like that, it's a good day for me. SIEGLER: Puffin Man is winding down his summer volunteer stint. Soon he'll look for another wild place to enjoy with visitors. UNIDENTIFIED PERSON #3: A family of science engineers. SIEGLER: Kirk Siegler, NPR News, Cannon Beach, Ore.
[POST-BROADCAST CORRECTION: In the audio, we say that a particular stretch of the Oregon coast is about as far south as you'll see a tufted puffin. In fact, tufted puffins are also found farther south at the Farallon Islands National Wildlife Refuge, about 30 miles off the coast of San Francisco.] Transcript provided by NPR, Copyright NPR.